I think the card above is my favorite. Which one do you like better? 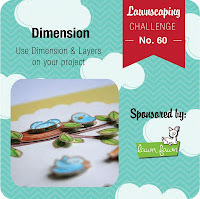 I'm entering the above card in the Lawnscaping challenge: "Dimension and Layers". 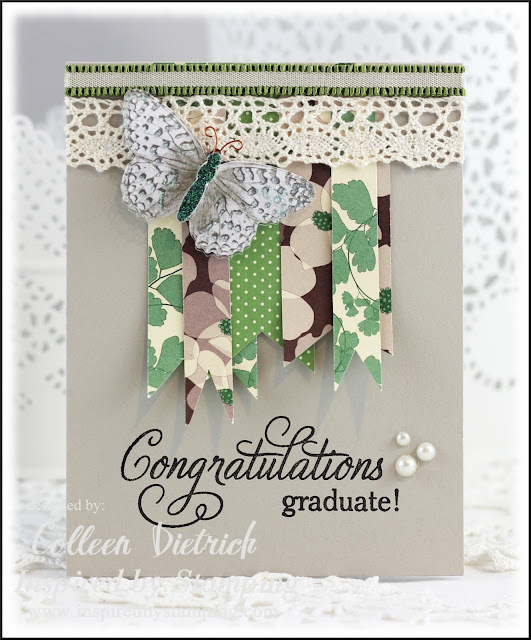 I believe this qualifies with the different ribbons, popped-up butterfly sticker and various papers layered onto each other. I'm also entering in a new-to-me challenge: Word Play Saturday. Their June challenge is "Summertime". Graduations remind me of summer, for sure. Big Congrats has become a go-to set for me. I can make New Home cards, Graduation cards, New Job, New Baby, and Engagement cards, all with one cute little set. And if I use "Congratulations" all on its own, I can congratulate anyone for anything! The flags on the first card get my vote! Both of these are wonderful, Colleen! Ohhh...such lovely cards, Colleen! 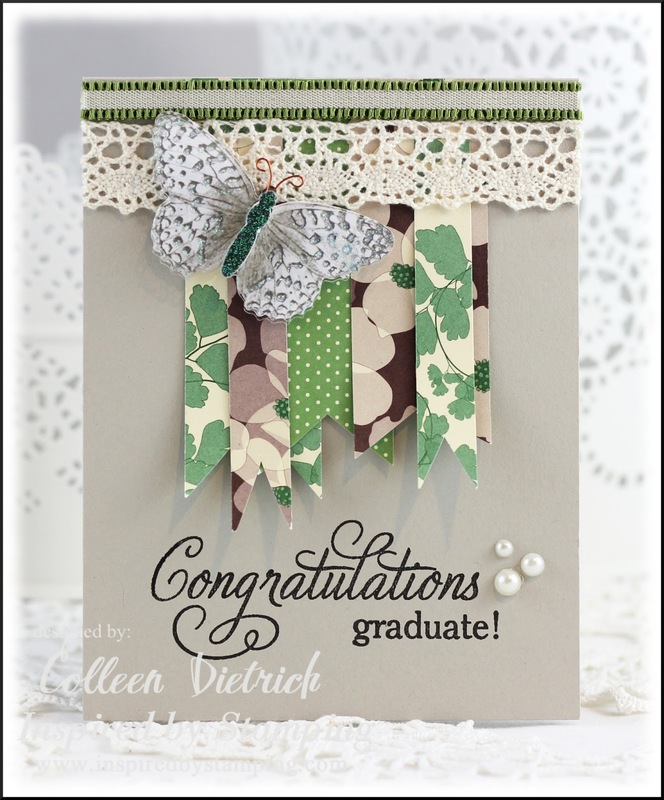 Love the floral paper, banners, and butterflies! I really can't decide which one I like best. Each one is unique and so beautiful! I haven't had foot surgery, but you will be better in no time. Just know that we're keeping you in thought and prayer...hugssss! I love both cards, Colleen, but there's something about those hanging fishtail tabs that always especially appeals to me. Yes, graduation is certainly a summertime theme. I haven't had a bunionectomy, but I know people who have and recovered quite nicely. It will be a little hard to get around for a while. Good luck to you! Lovely ! I loved the first one more !All the best for your Surgery ! I just can't decide - LOVE them both!!! Didn't know about cards going (only) digital - sooo sad - Love flipping through those Magazines Before I fall asleep. I think the first might be my fave too - such a fun layout, and a great way to use up little bits! I Think both cards look great. I just love the banners on the first card. 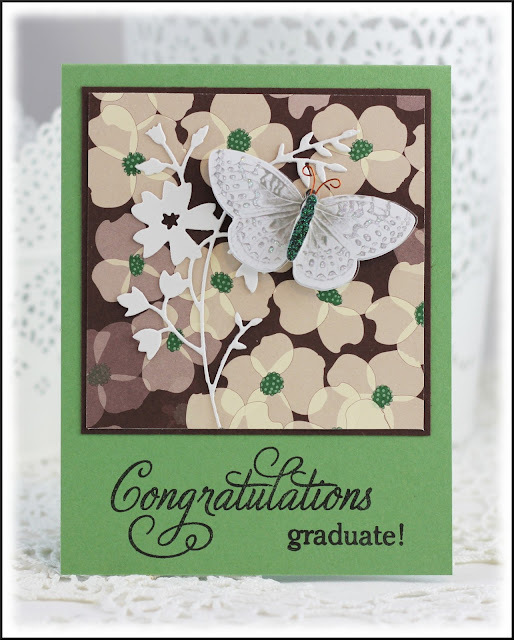 The way they are layered looks great, But I also love the butterfly on your second card. I do hope all goes well with your surgery. When you said pins in your bone, I cringed. But I am sure all will be fine.. I love them both. I can not and will not choose, lol! Thanks for joining us at Lawnscaping! These are both simply stunning! Loving the designs and papers. I think the first one is my favorite one too, but it's hard to choose. Thanks so much for playing along in my summertime wordplay saturday challenge at my creative moments. Beautiful cards! That banner trend is so hot right now. I'm seeing it everywhere! Thanks for playing with us at Lawnscaping! Both of these are pretty Colleen. I love the banners on the first and the pretty die and paper on the second. Just beautiful.